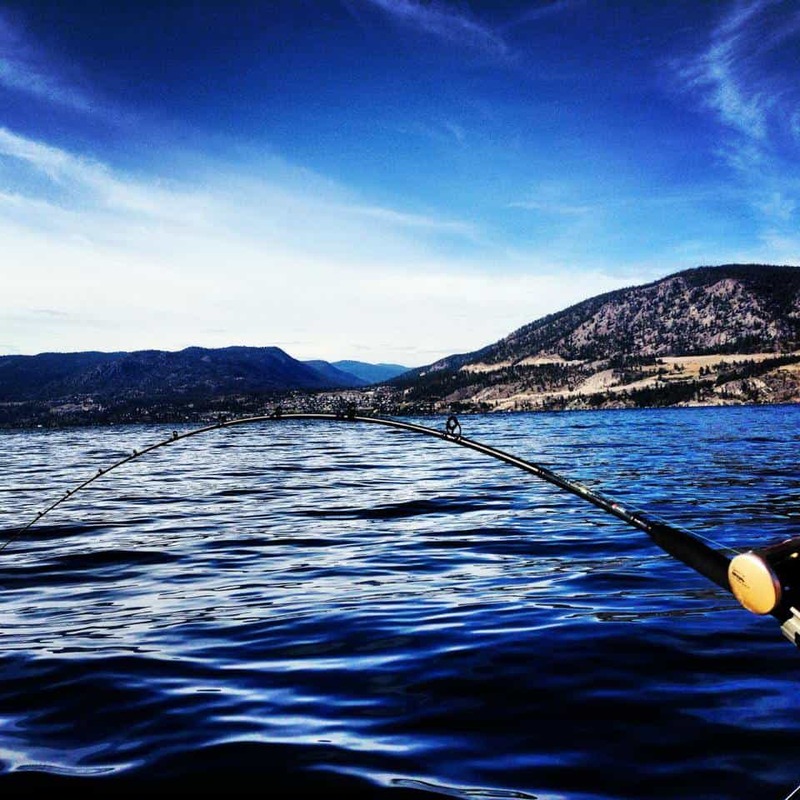 From the north end of the Okanagan being Mabel Lake to the south Okanagan of Osoyoos Lake, there is no shortage of lakes that offer great fishing opportunities. 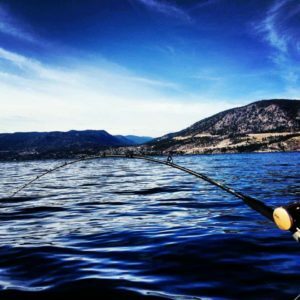 One lake that is seldom sought after by anglers and is fairly an underrated fishery is Okanagan Lake. 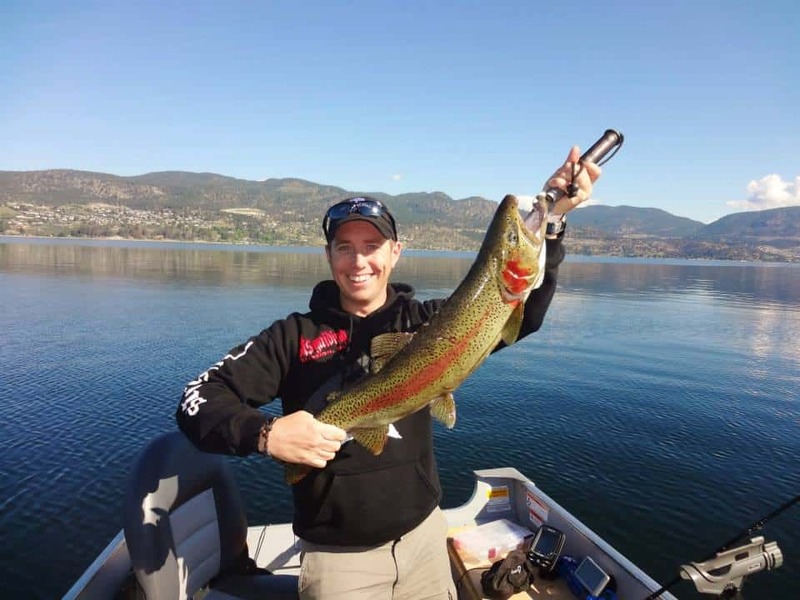 Okanagan Lake provides a wide variety of fishing opportunities for Kokanee, Lake Whitefish, Burbot and Rainbow Trout that can reach well over 20 pounds! With the lake being over 135kms long there is a lot of water to cover to find the fish. However, when you do track them down you may be in for a battle with a fish of a lifetime! This lake is very popular for water sports so there are a lot of access points to launch your boat. The lake also offers great fishing from shore for smaller rainbows, whitefish and pike minnows that provides terrific family fishing opportunities. 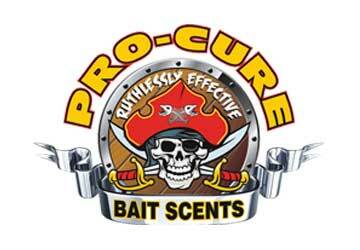 Fishing with bait and float or bottom set up with bait work well from the shoreline. Since the lake is so large trolling is the best practice to cover water and to hunt down the fish. The time of year will most likely determine the depths at which are going to be fishing. In the winter months between November and January ripping bucktails just sub surface can produce well as the bigger rainbows are cruising near the surface feeding. Later in spring and early summer trolling plugs, Apex’s and spoons between 20-60 feet usually will bring good results. June seems to be the better month in the early season. If you don’t have your boat rigged with downriggers then make sure to have 2 to 6oz weights in your tackle box. As the Okanagan summer heat moves in the fish tend to go deep. In the summer months downriggers are a must! Most of the fish will be hugging in and around the thermocline of the lake which fish can mark between 40-100 feet deep. Fall can be a very exciting and productive time to fish as the Kokanee start their spawning cycle. 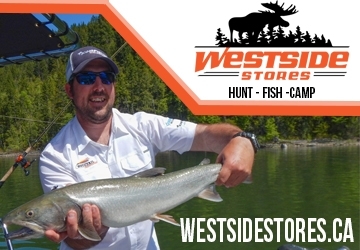 Kokanee are the main food source for the larger rainbows in the lake, so as the Kokanee start to come up closer to the surface and shorelines so do the big trout. Lure size and colour patterns are important to take into consideration when fishing Okanagan Lake. Just like fly fishing, you need to match the food source in which the larger rainbows are feeding on. As noted, Kokanee are the primary prey so it is best to match your lures to the size and colour of the Kokanee in each stage of the year. Good colour patterns that have proven well for me are: spring: green/white or straight silver; summer: blue/white, black or grey/white; fall: red-orange/white or brown/white. Small Rainbows are also a food source so a lure in rainbow or watermelon colour can produce good results year round. It is always good to have a variety of lure sizes in your arsenal. 95% of the time a 3 to 4 inch lure produces the best. However lures as small as 1 inch and as large as 6 inch can make those slower days really turn on. Most locals including myself fish Okanagan Lake with Lyman Lure Plugs; a locally owned Kelowna company. These wooden plugs provide incredible real life action that these Okanagan Lake beauties can’t resist. Some good patterns that I recommend are #10, #14, #31, #69, #84, #96, #97, #98, #149, #160, #176 (#176 – Okanagan Lake Derby Winner June 2013). Okanagan Lake has a barbless hook restriction; which allows anglers the option of fishing barbless treble hooks. One of the benefits of fishing a barbless treble hook over a large single hook is when a smaller fish hooks your lure. The larger single hooks tend to hook the smaller fish through the head and into the brain cavity, killing it. 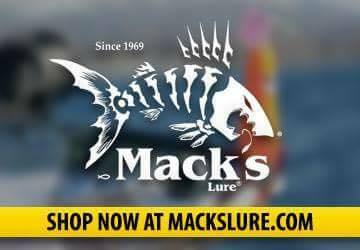 The barbless treble hooks don’t allow the smaller fish to get caught as easily as their mouth’s can fit over the hook. If they do get hooked the hook isn’t big enough to puncture up through the head, reducing mortality rates. This is one restriction that was closely studied and decided on in collaboration between experienced local anglers and the ministry biologists. Even though Okanagan Lake does offer an abundance of fishing opportunity this fishery is not what it used to be. Due to the introduction of Mysis shrimp in the lake the Kokanee fry and shrimp compete over the same food source being Zooplankton. Since the shrimp outnumber the fry, the shrimp tend not to leave much food behind for the Kokanee population to thrive. Hence the less Kokanee available the less food source for the Rainbow Trout to thrive and grow. Some may also say that over harvesting of the Rainbow Trout over the years has also contributed to the decline in the population. The good news is that the ministry along with active conservation groups are working hard on helping to restore spawning habitat for Kokanee. 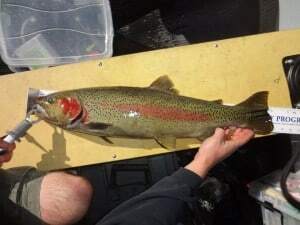 As anglers we can also do our part to help this fishery bounce back by practicing ethical catch and release methods of these stunning Rainbow Trout. 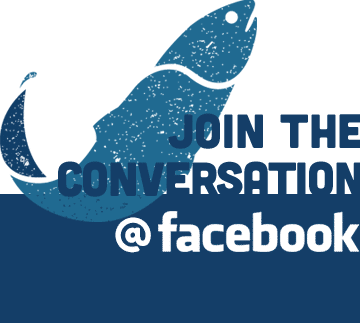 To help create the awareness of this marvelous fishery and the benefits of catch and release; each year a series of Kelowna Fishing Derbies is put on by Suncruiser Media and Rodney’s Reel Outdoors. The derby encourages catch and release practices by declaring the winners based on the length of the fish only. This allows the angler to take a picture of the fish with the tournament ruler and then releasing the fish for another day. Who knows maybe the same fish may even win multiple derby events! Be sure to enter the Kelowna Fishing Derby for your chance to win big prize money and to reel in the fish of a lifetime! 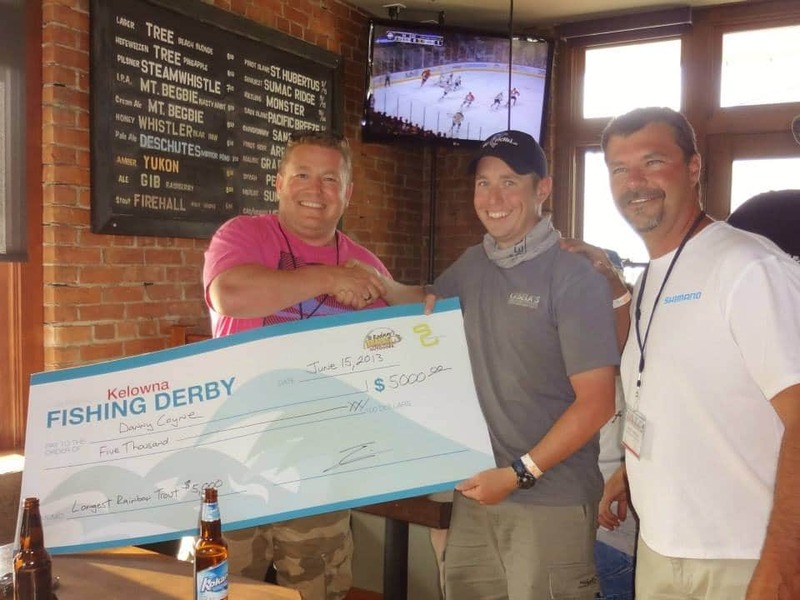 Proceeds of the derby go back into the Okanagan Fishery and BCWF Youth Programs. 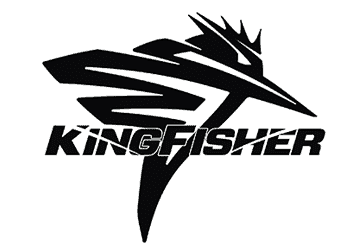 For more information about fishing Okanagan Lake please feel free to contact us at BCFishn.com. Remember to share your pictures and stories on our Facebook Page. Or if you are looking for a fantastic day of fishing with a friendly and professional guide, contact one of our local Okanagan Guides: Rod Hennig at Rodney’s Reel Outdoors or Mat Hanson at Love2Fish Charters. 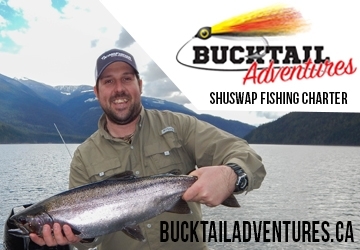 These guys are masters at catching large rainbows on Okanagan Lake, check out their websites for proof!